Ella is a great Nail Technician. Let us say it again…Ella is a great Nail Technician. On top of that (which is awesome!) she is also incredibly sweet and smart and interesting. It’s a pleasure to be her client (and co-worker.) While Ella’s favorite service is either a relaxing pedicure or a impeccable Shellac manicure, she’s a perfectionist at everything she does. That alone makes her invaluable to us, and you! 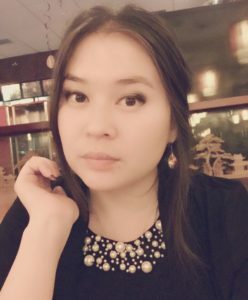 Originally from Kazakhstan, where she spent 8 years at Medical University, Ella has been in the US since 2015. Her mission has been perfecting her English so she is 100% prepared when she takes the USMLE (United States Medical Licensing Exam.) Interesting, right? She works hard all day at Joseph Michael’s and studies passionately when she’s not. It’s that passion that we have all become so in awe of. It’s her kindness, her smile and her talent that we have found we can’t live without. Ella works Wednesday through Sunday. See our nail care menu here.